Kingpin Designs is honored to present the exclusive first series of pins featuring fully licensed artwork from the legendary artist, Rick Griffin!! Rick Griffin was one of the originators of the San Francisco psychedelic art scene to blossom out of the late 1960s and early 1970s. 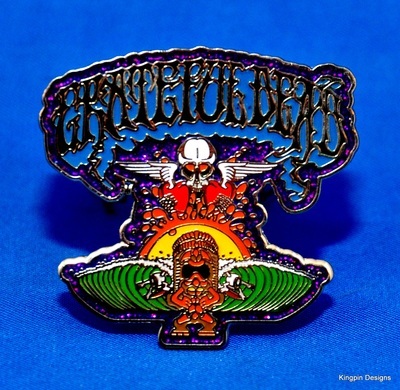 His art is featured on some of the most iconic posters and album covers of the time, including the Grateful Dead albums "Wake of the Flood", "Aoxomoxoa", and "Reckoning" among many other classics. 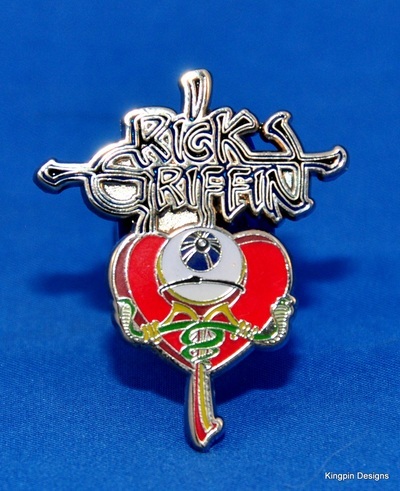 These pins were especially challenging to produce, as Ricks art was all created long before the digital artwork medias of today existed, so all of these designs started out as photos or scans of Rick's art, which then had to be meticulously digitalized to match his art as closely as possible. 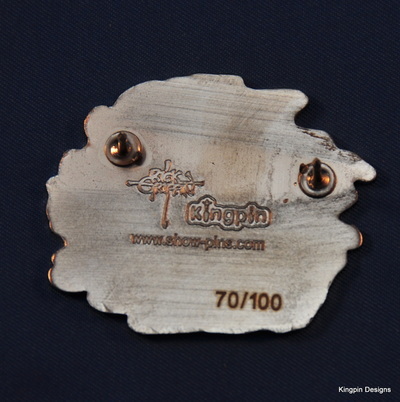 The result is incredible. 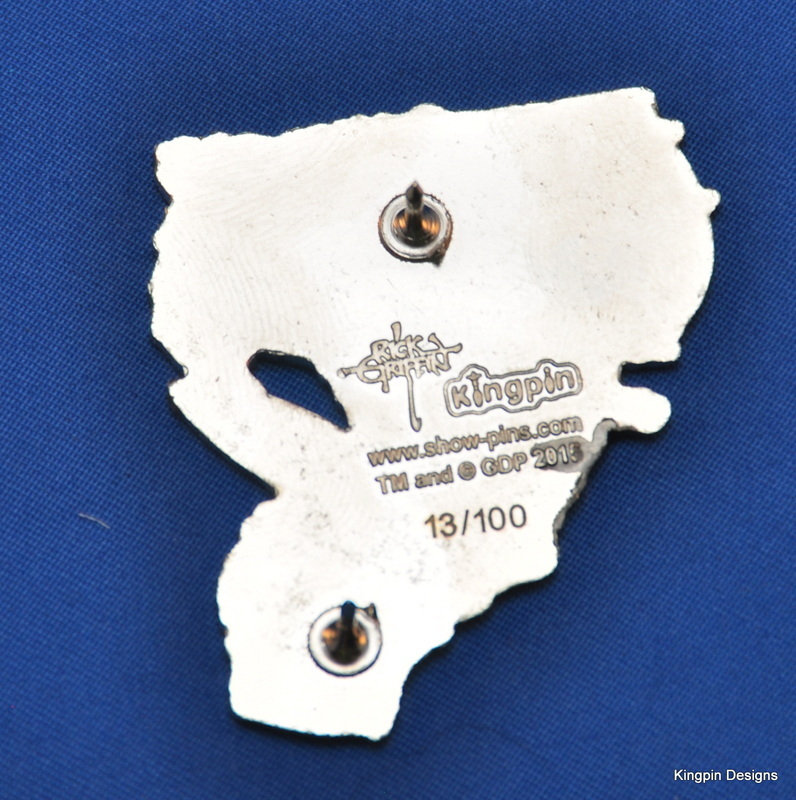 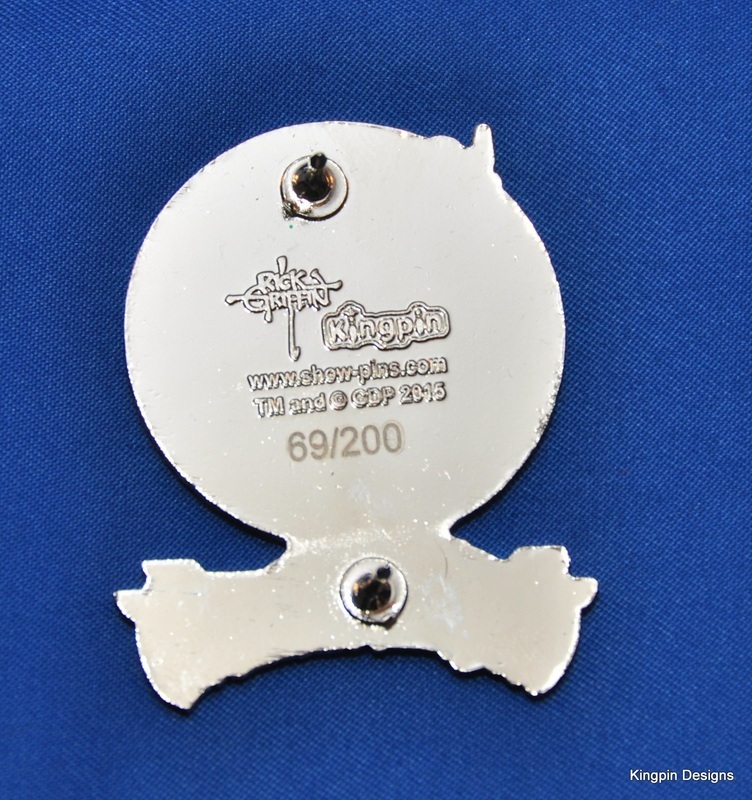 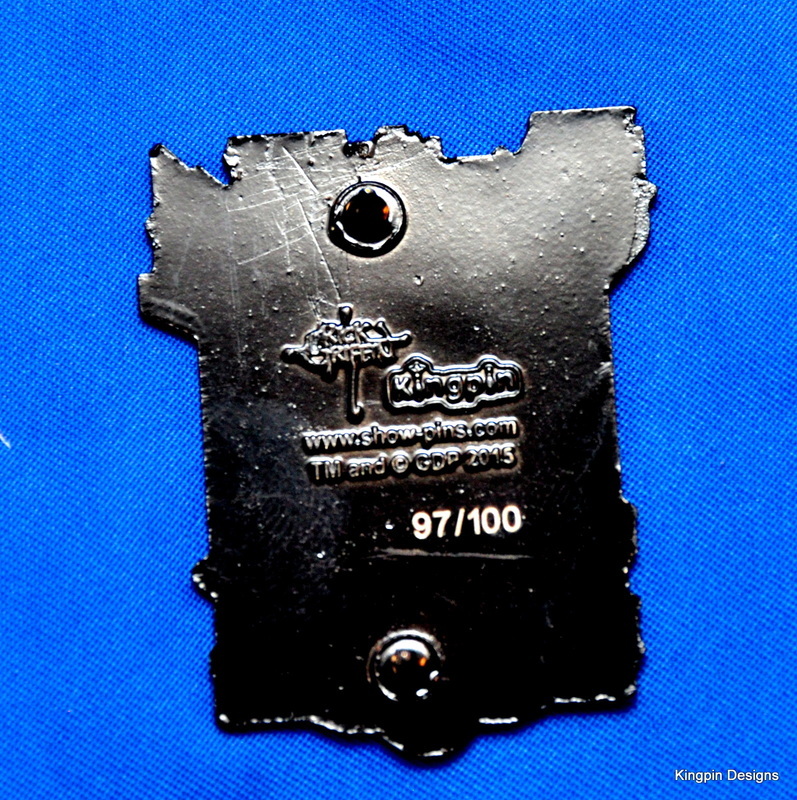 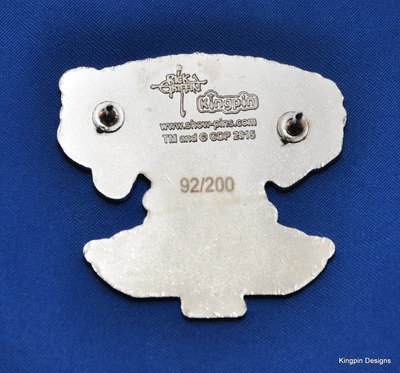 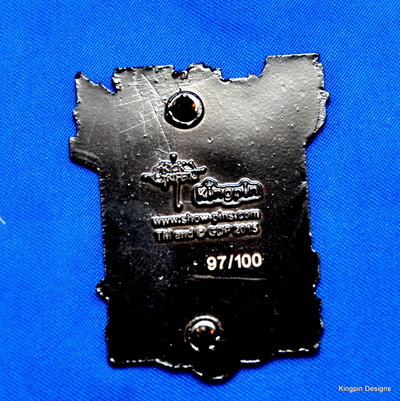 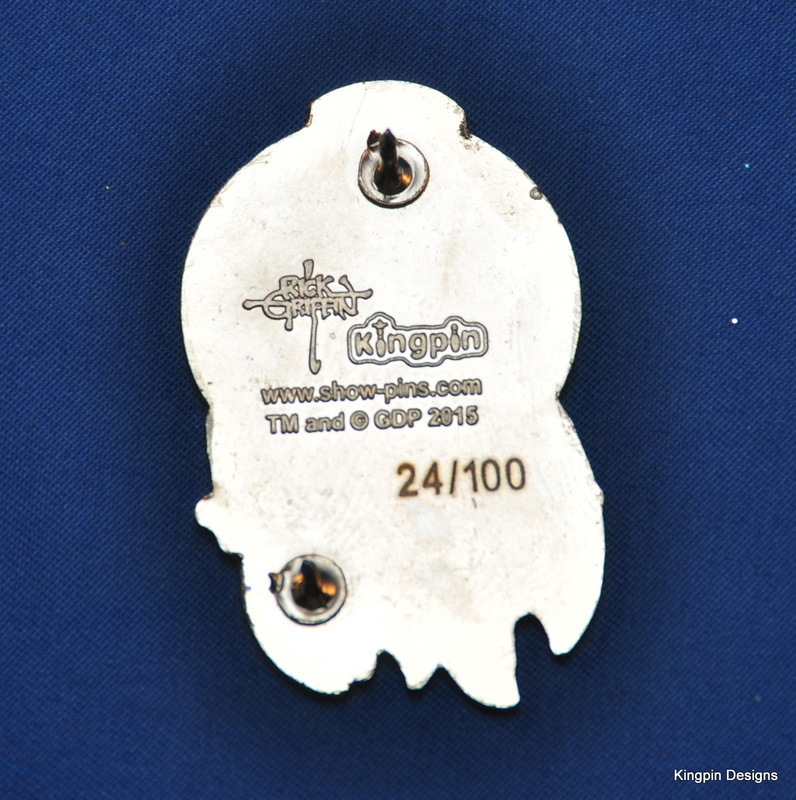 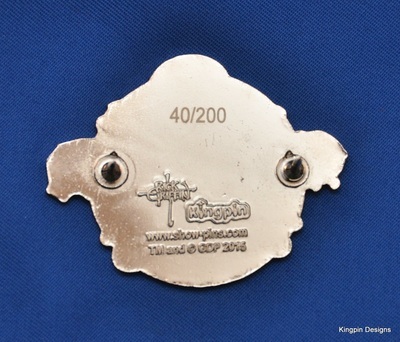 These are some of the most highly detailed and highest quality pins that Kingpin Designs has produced. 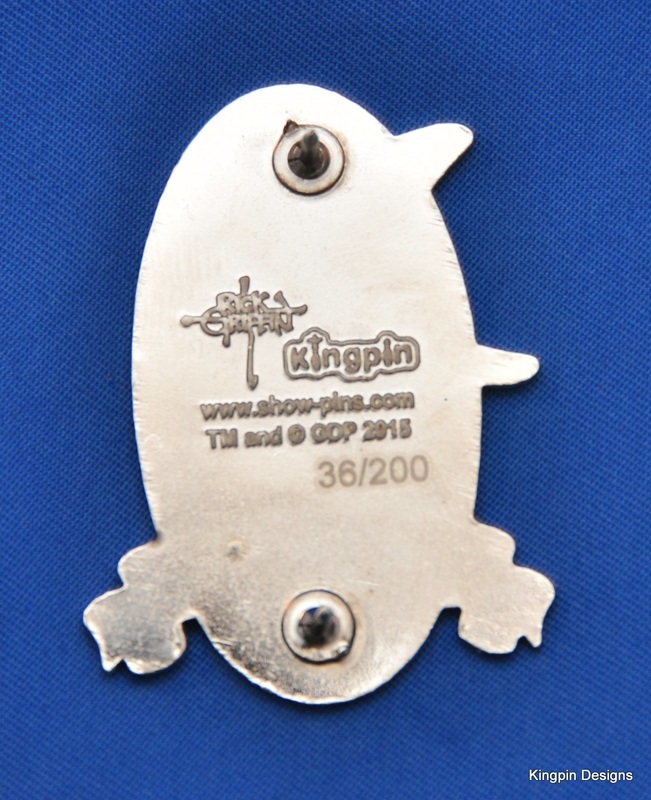 They are truly something special, limited to only 200 of each pin, available exclusively though Kingpin Designs. All pins are hard enamel with 2 backs, feature Rick Griffin's signature and the Kingpin Designs logo on the back, and are individually numbered. Series 1 is limited to 200 pins of each design, and Series 2 is limited to 100 pins of each design. 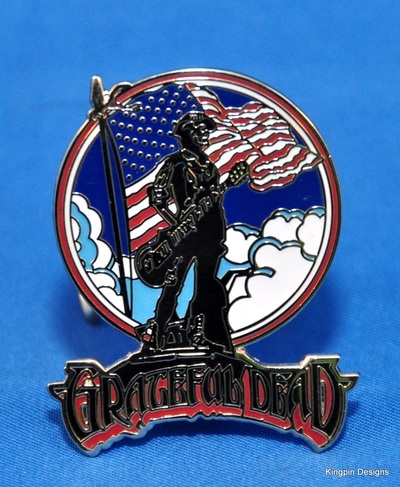 All images and artwork are used with permission and full licensing from Rick Griffin's family, and all Grateful Dead images are fully licensed through Grateful Dead Productions. 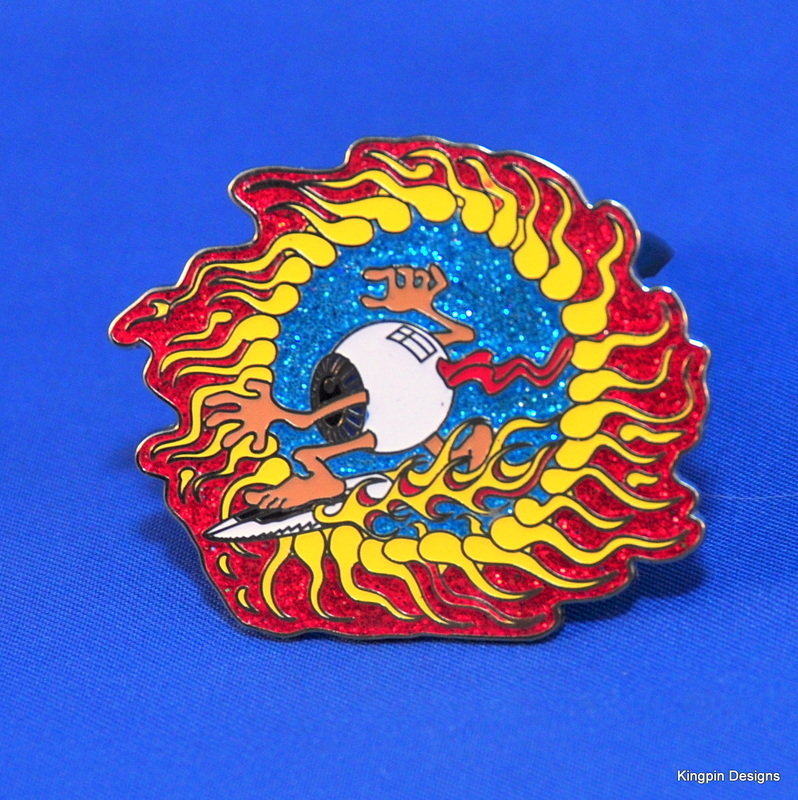 All pins are accompanied by a Certificate of Authenticity. 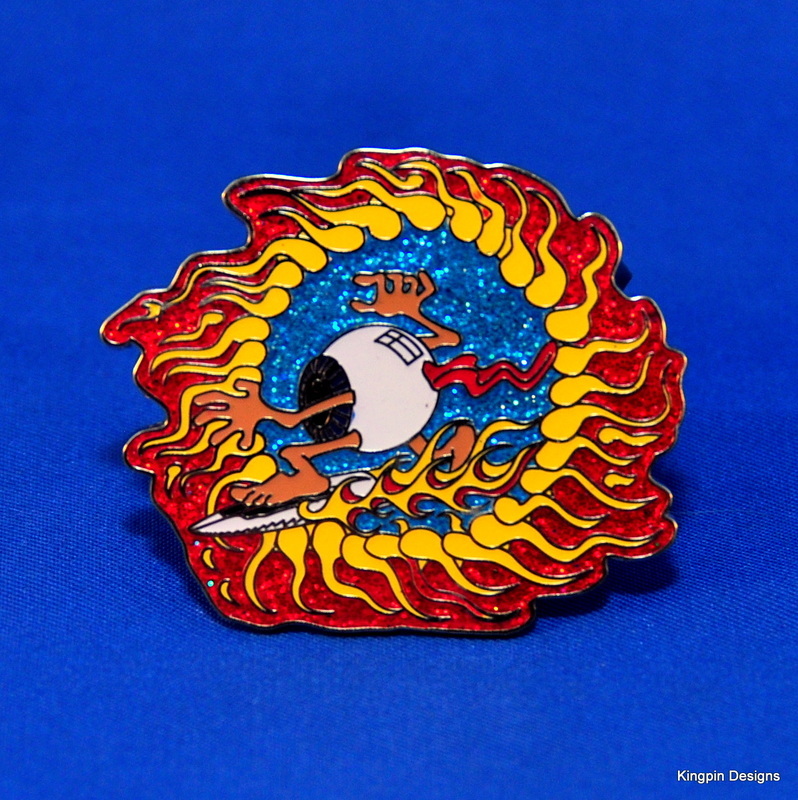 All pins are hard enamel, 2 pin backs, stamped with Rick's signature and the Kingpin Designs logo. 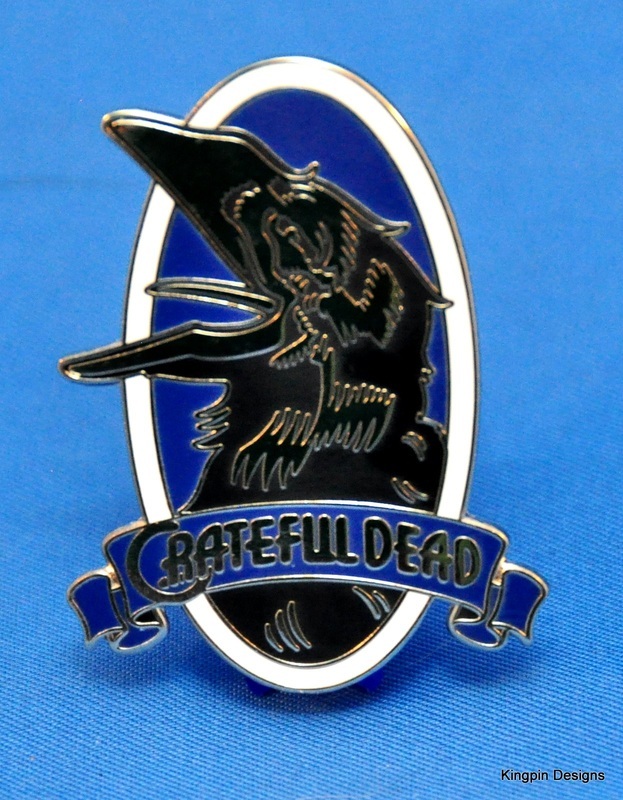 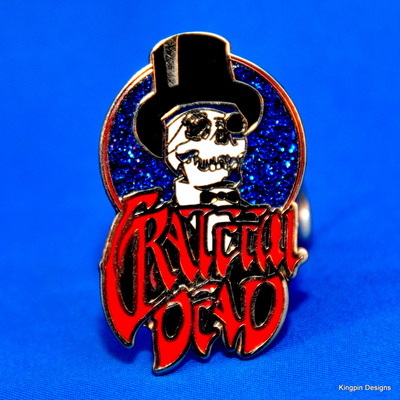 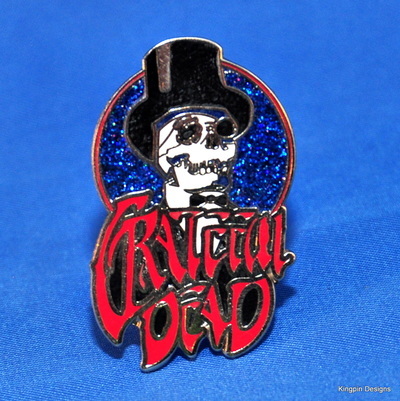 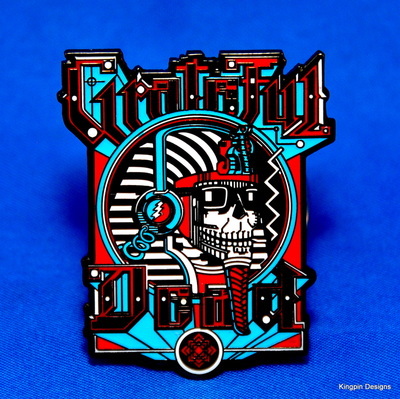 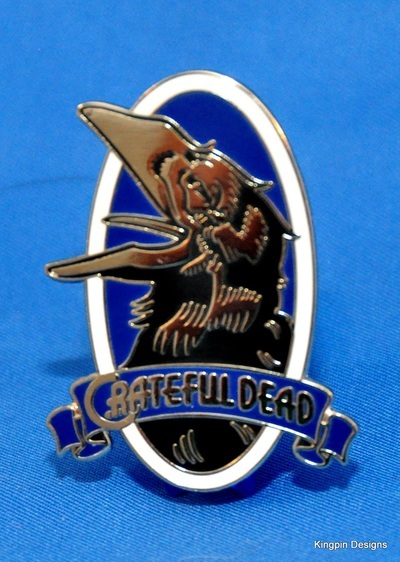 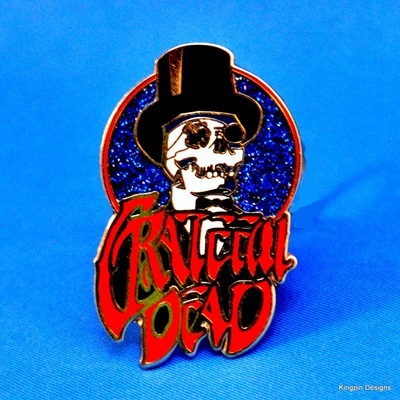 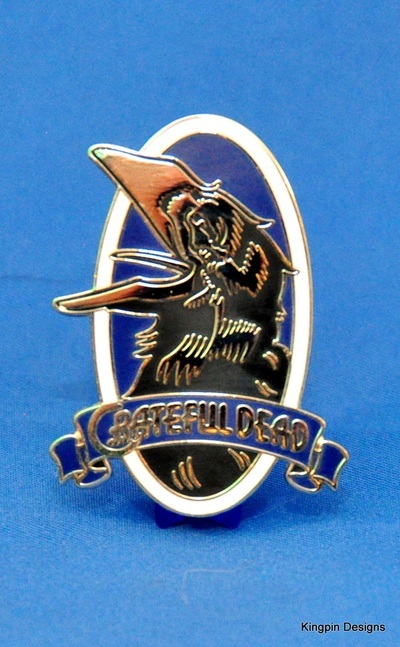 All images and artwork are used with permission and full licensing from Rick Griffin's family, and all Grateful Dead images are fully licensed through Grateful Dead Productions.All pins are accompanied by a Certificate of Authenticity. 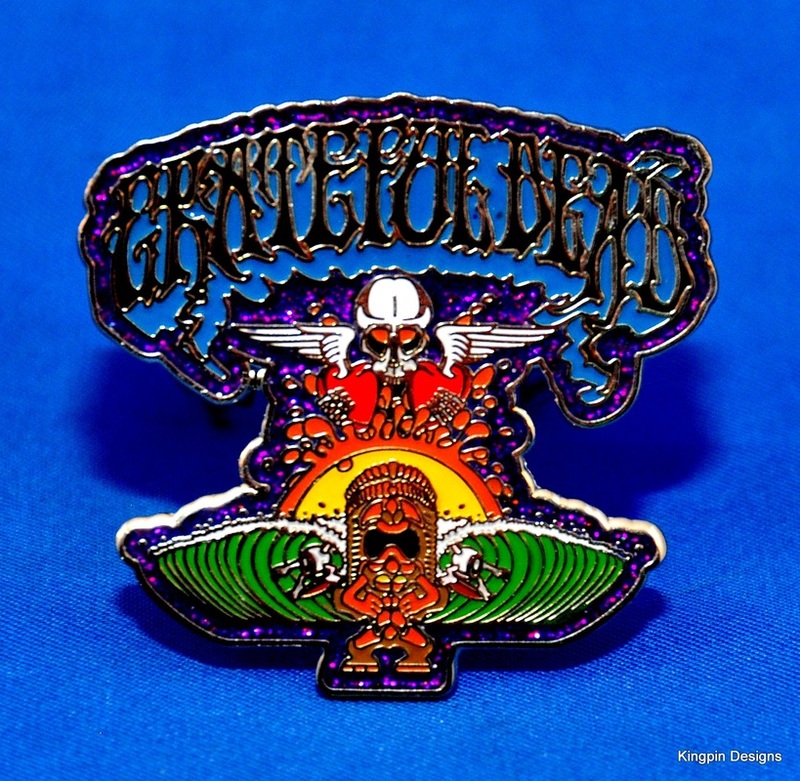 Featuring iconic artwork from the classic Grateful Dead album: The Wake of the Flood. 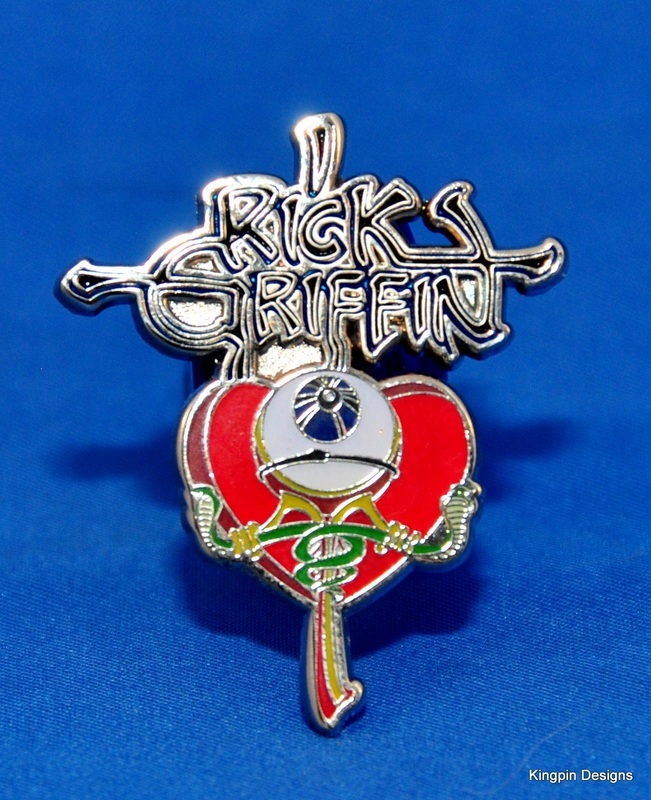 The artwork from this pin is Ricks most iconic signature artwork, and is also featured on the cover of the book "The Art of Rick Griffin", published by Last Gasp of San Francisco (a fantastic comprehensive book covering Rick's body of work). 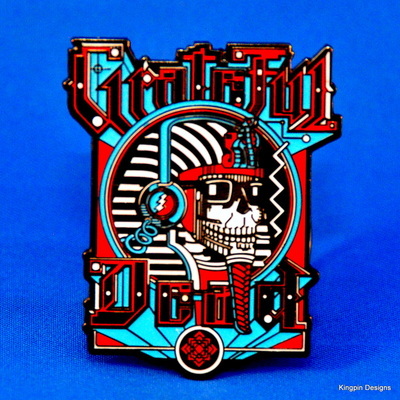 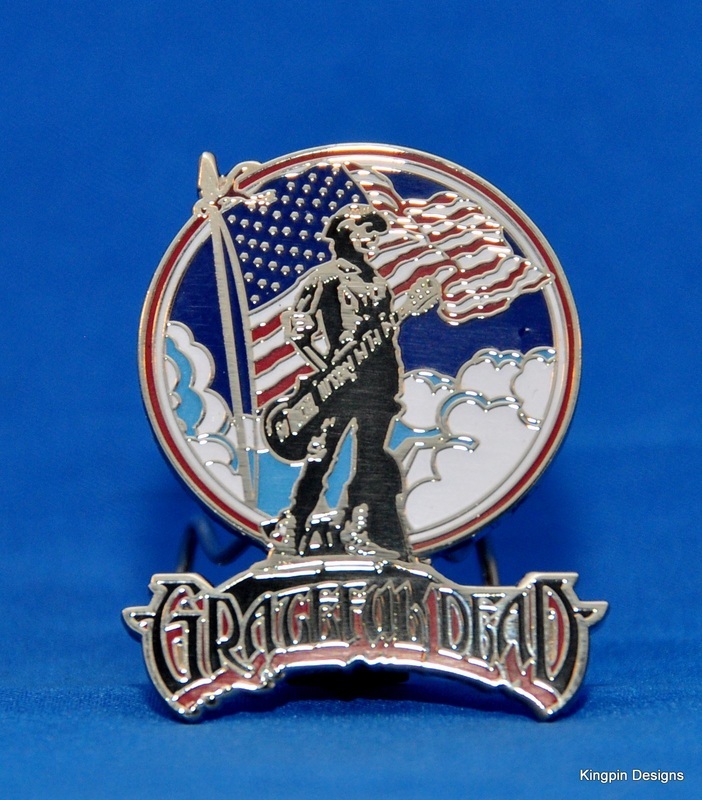 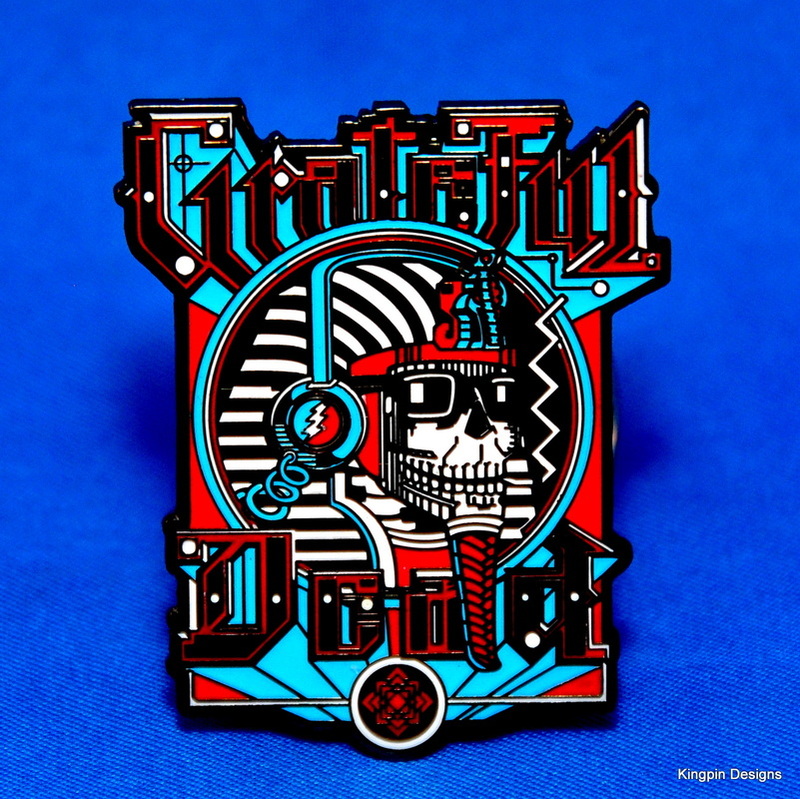 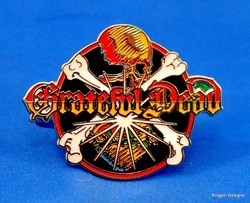 Created using artwork from the 20th Anniversary poster that Rick created for the Grateful Dead, the image on this pin is as relevant today as it was 30 years ago. 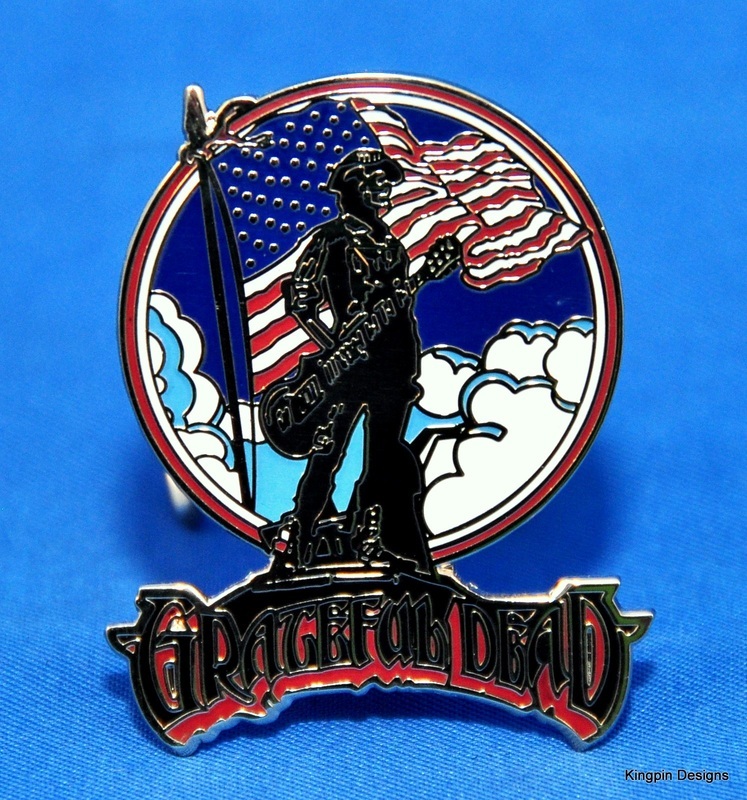 A timeless classic, celebrating arguably the most American band ever. 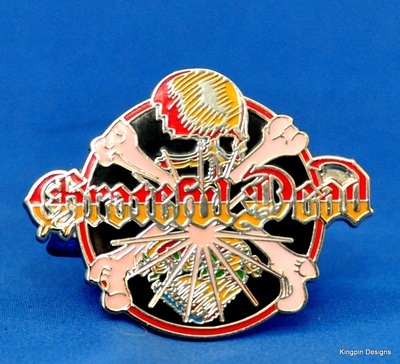 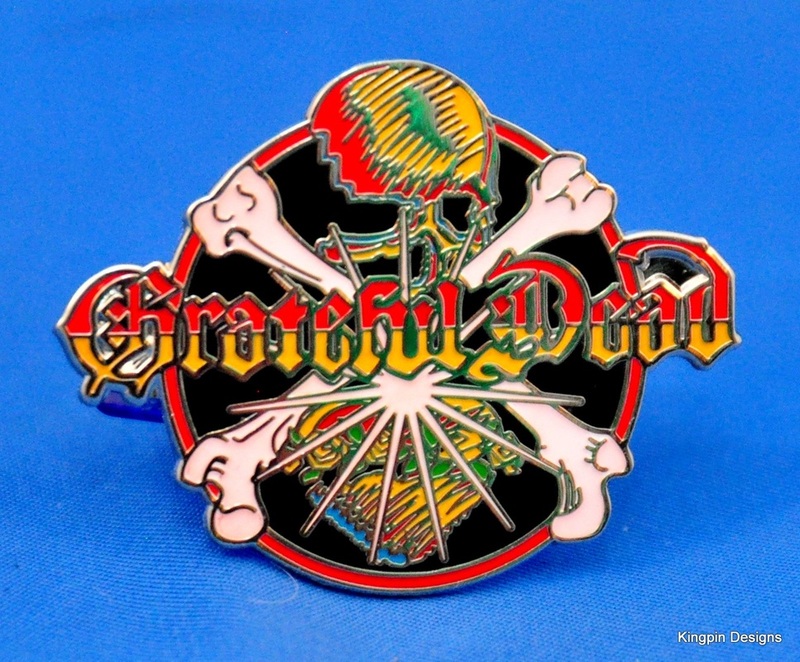 The artwork featured on this pin comes from the preliminary drawings Rick sketched up for the 1980 Grateful Dead album "Reckoning". 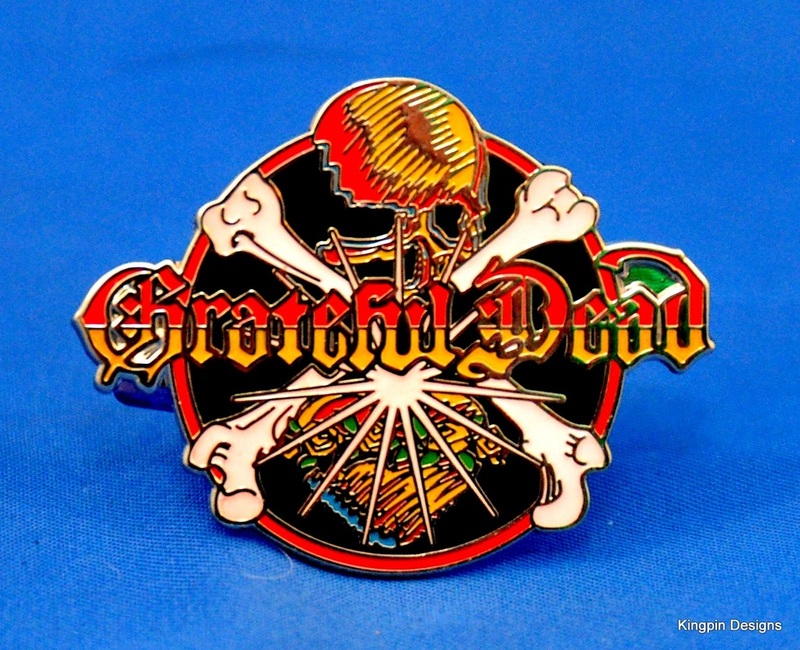 the actual album cover shortened the text across the front down to a simple "GD" on either side of the crossed bones. 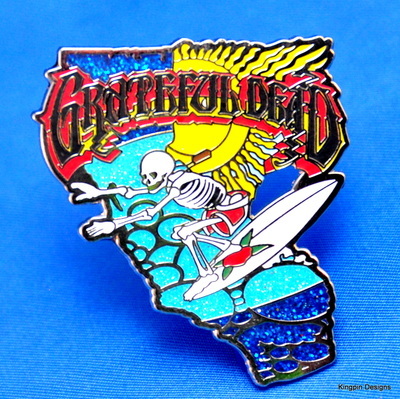 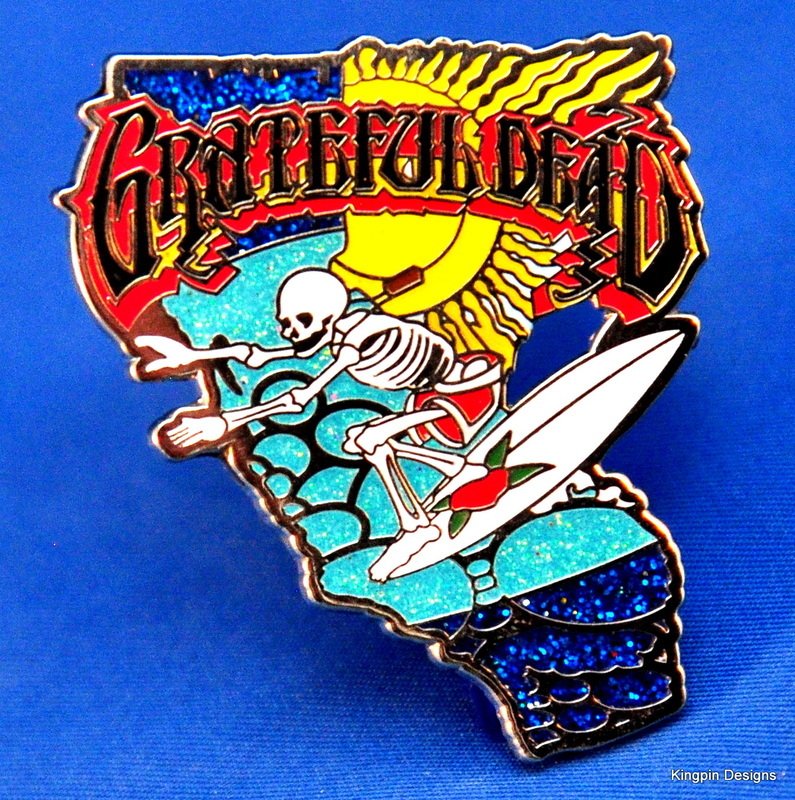 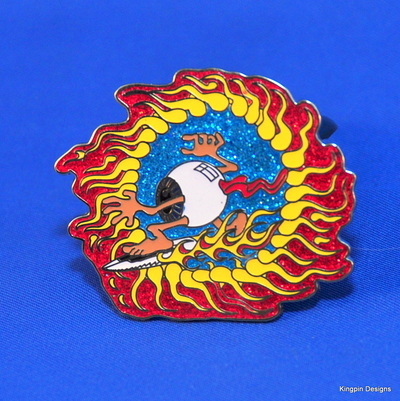 Rick Griffin was a California surfer above all else, and this pin combines all of his passions - surfing, his home state of California, the Dead, and art. 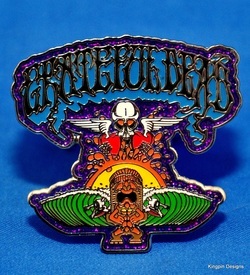 It is a beautiful design and a beautiful pin! 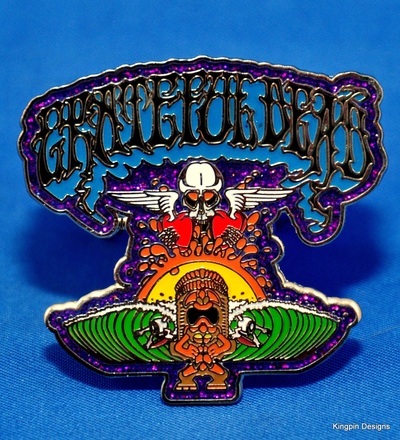 This pin features Rick Griffin's iconic artwork that was created for the official posters from the 1984 Berkley Community Center 6 show run. When Rick Griffin was a young man he was in a car accident and lost an eye. 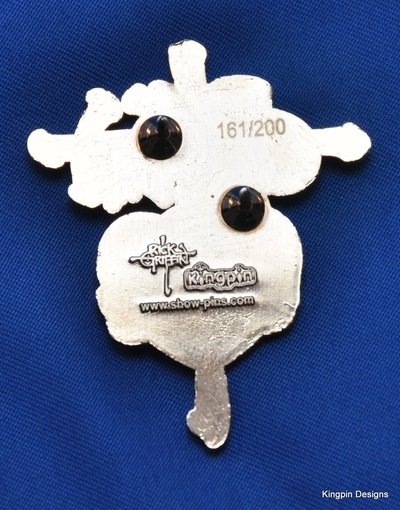 From that point forward the detached eyeball became a constantly recurring image in his artwork. 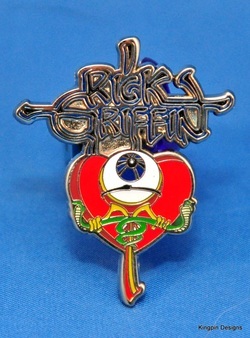 This surfing eye artwork is as iconic and representative of Rick as his signature is. Featuring the artwork from the Grateful Dead's 25th Anniversary official artwork from Rick Griffin.